Waltrip's final race will be at Sonoma this June. 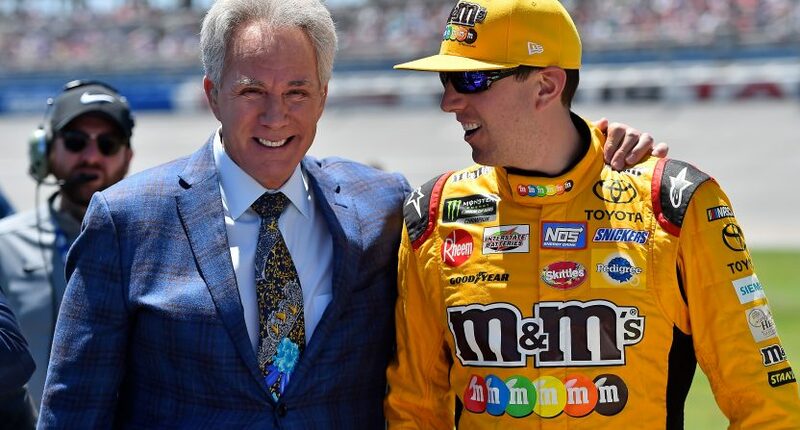 In his 19th season as a race analyst for Fox Sports, NASCAR Hall of Famer Darrell Waltrip is set to end his broadcasting career at this June’s race at Sonoma, Fox’s final NASCAR race of the season. There had been reports that the 72-year-old Waltrip was considering retirement, and that sparked a debate from those for and against the move, which spiraled out of control at times over the past few days. In an exclusive conversation with Mike Organ of The Tennessean, Waltrip said he chose this Bristol race weekend as the right time and place to announce his retirement. Not only is Bristol Motor Speedway in Waltrip’s native Tennessee, it is the place where he had his biggest success, winning 12 races from 1978-92 (including seven in a row from 1981-84). Waltrip began his broadcasting career with Fox right after retiring as a driver. As one of the original on-air people from Fox’s first year in NASCAR, his career began in difficult fashion, calling his brother Michael (now a Fox NASCAR analyst) to his first career victory in the 2001 Daytona 500, which is more remembered for Dale Earnhardt’s fatal crash. Early on, Waltrip’s reputation as an outspoken figure on the grid made him a perfect race analyst. Over the years, he combined that with a more light-hearted style, culminating with his traditional “Boogity, boogity, boogity” catchphrase before each race, which fans either seemed to love or hate. Waltrip was nominated for a Sports Emmy in 2007 for Outstanding Sports Personality. Waltrip told Organ there are multiple reasons why now is the right time to move onto the next chapter. Those thoughts of retirement started in 2017; Waltrip originally felt that was the right time, considering his number was 17 for a sizable portion of his career. But feeling he wasn’t quite ready to bow out, Waltrip kept going. Now, though, he’s enjoying babysitting his newborn granddaughter. And after missing out on seeing his daughters grow up, he wanted to be around more to see his granddaughter grow up. Another sign that it was time for Waltrip to contemplate retirement was the insertion of Jeff Gordon to the crew. It’s nothing that Gordon or Fox, did but Waltrip noticed Gordon was more in-tune with the more modern aspects of the sport than he was because Gordon just retired. That was where many, including I, noticed that Waltrip could have been better served in another role on Fox’s NASCAR crew than being in the booth with Gordon. Kind of like CBS with Phil Simms and Tony Romo, the athlete-turned-analyst who had been retired for 20 years can only do so much around someone fresh out of the game. CBS put Simms into the studio for Romo, who is regarded as one of the best NFL analysts out there because he just retired and knows the modern intricacies of the game as only someone who played would know. Gordon raced these cars and raced against these drivers and Waltrip didn’t. And when the two of them were in the booth at the same time, even those outside the media could notice that Gordon was able to explain some things better than Waltrip. To Fox’s credit, they remained loyal to Waltrip and kept him in the booth. I, for one, had been vocal in wanting to see Waltrip in the studio where he could interact with his brother and not be in a position where he can be directly compared to Gordon. That isn’t a slight on Waltrip, it’s just the nature of the beast as a former athlete-turned-analyst. If Romo and Gordon choose to have 20-year broadcasting careers, they aren’t going to know as much about the formations or the cars as those things evolve and some newly-retired athlete will come in and eventually be better than them. Now that this retirement is official, the NASCAR community can come together to wish Waltrip well as he embarks on the next chapter. Even those who may have been on the side of wanting him to bow out or didn’t care for his lighthearted broadcasting style cannot discount how important Waltrip has been to the sport over the past 45 years. This June will definitely be the end of an era in NASCAR broadcasting and his replacement will have some big shoes to fill.